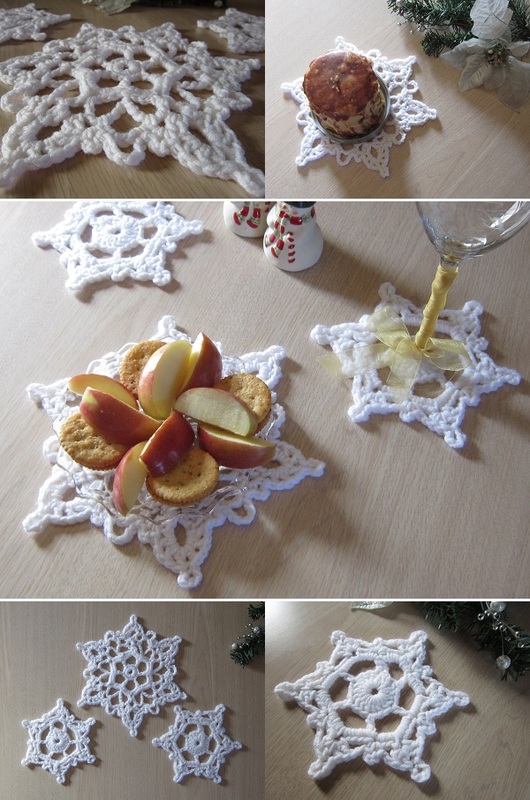 These snowflakes can be used together as a table set or separately as ornaments. The larger doily measures 9" (23 cm) across, and the smaller coaster is 6" (15 cm) in diameter. (Both measured at widest place from point to point.) 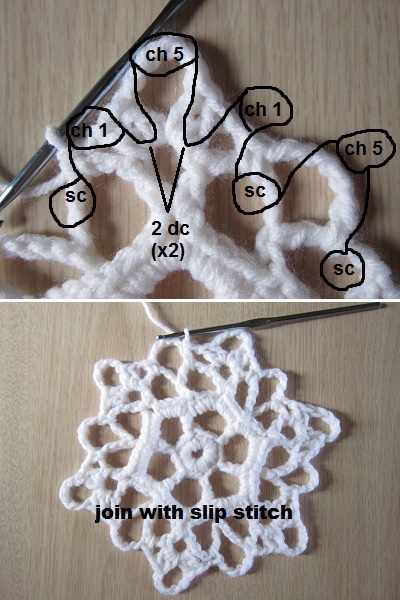 The six-inch snowflake only uses basic stitches and should be suitable for most beginners. The nine-inch snowflake requires a back-post double crochet, making it more of an intermediate pattern. It only took some scrap to make one doily and two coasters... 1/2 oz per coaster, and between 1/2 and 1 oz for the doily. *optional for ornament use - Add some sparkle! Attach beads with a needle and thread, coat with glitter glue, or hang a large pendant bead from the bottom with some jump rings... Use your imagination and craft supplies to give your project an extra touch. Chains at beginning of rounds do not count as stitches. 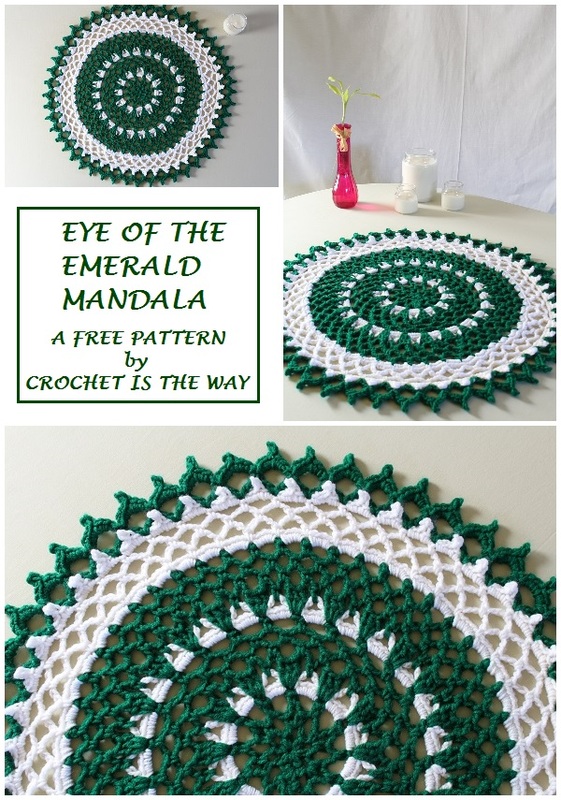 The large doily shown begins with a round of single crochet stitches, and both coasters shown begin with a round of double crochet. 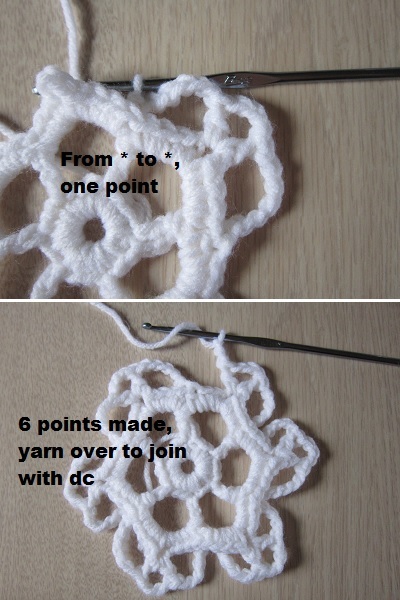 The double crochet center could be used to start the large doily, but the single crochet center could make the coaster too small. This doesn't matter if you're using the patterns for ornaments, so have fun mixing and matching! Back post double crochet (only for large doily) - Yarn over, insert hook from back to front, before the post of the stitch. Going over the post, insert the hook from front to back on the other side of the stitch. Yarn over, pull up a loop (3 loops on hook). Yarn over, pull through 2 loops. (2 loops on hook). Yarn over, pull through last 2 loops. Chain 5, join into a ring with a slip stitch. Chain 1 (does not count as stitch). 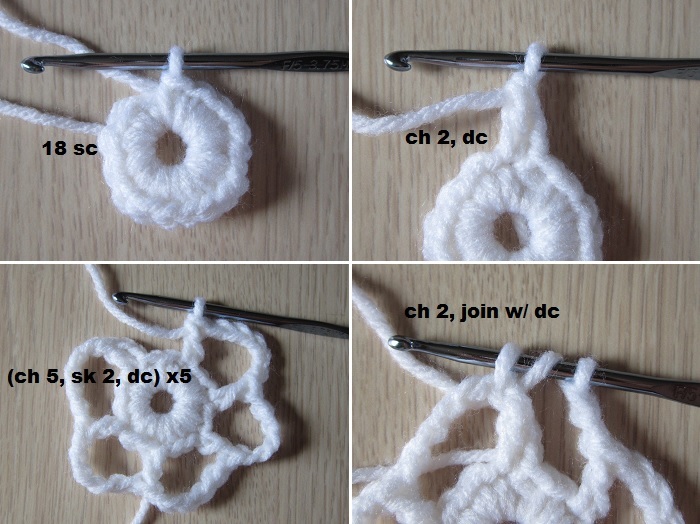 Make 18 single crochet in ring. Join with a slip stitch to first single crochet made. Chain 2, double crochet in first available stitch. (5 chain, skip 2, double crochet) 5 times. 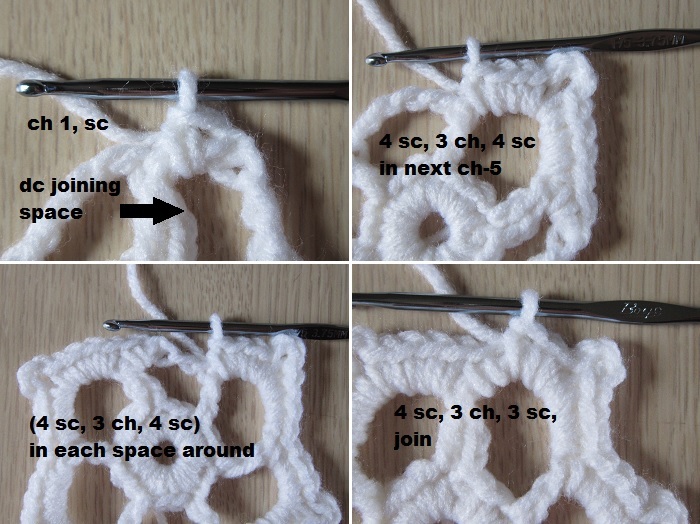 Chain 2, join with a double crochet in the first stitch made (counts as chain-5 space; referred to as "double crochet joining space" below). Chain 1, single crochet in the double crochet joining space. (4 single crochet, 3 chain, 4 single crochet) in each of the next 5 chain spaces. In the double crochet joining space, make 4 single crochet, 3 chain, 3 single crochet. Join with a slip stitch to the first single crochet made. Back-post double crochet in the first available double crochet of Round 2. *Chain 5. (Double crochet, 5 chain, double crochet) in chain-3 space**. Chain 5, back-post double crochet in next double crochet of Round 2. * Repeat from * to * 4 more times. Repeat * to ** once. 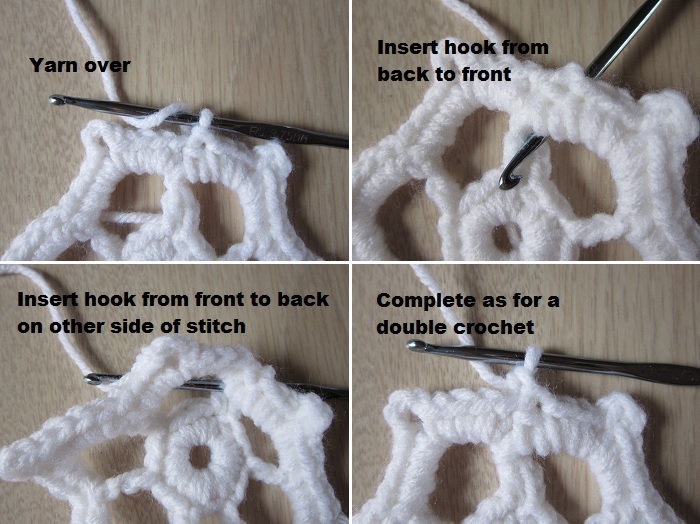 Chain 2, join with a double crochet in the first back-post double crochet made. Chain 1, single crochet in the double crochet joining space. *Chain 5, single crochet in the next chain-5 space. (1 chain, 2 double crochet, 5 chain, 2 double crochet, 1 chain)** in chain-3 space. Single crochet in next chain-5. * Repeat from * to * 4 more times. Repeat * to ** once. Join with a slip stitch in the first single crochet made. Chain 1. *(Single crochet, 6 chain, single crochet) in the next chain-5 space. (Single crochet, 3 chain, single crochet) in the next chain-1 space. [In the next chain-5 space make - (Double crochet, 1 chain)2x, double crochet. 5 chain, slip stitch in the top vertical bar of the last double crochet. (Double crochet, 1 chain)2x, double crochet]. (Single crochet, 3 chain, single crochet) in the next chain-1 space. * Repeat from * to * 5 more times. Join with a slip stitch to first single crochet made. Chain 5, join into a ring with a slip stitch. Chain 3 (does not count as stitch), make 18 double crochet in the ring. Join with a slip stitch in the first double crochet made. 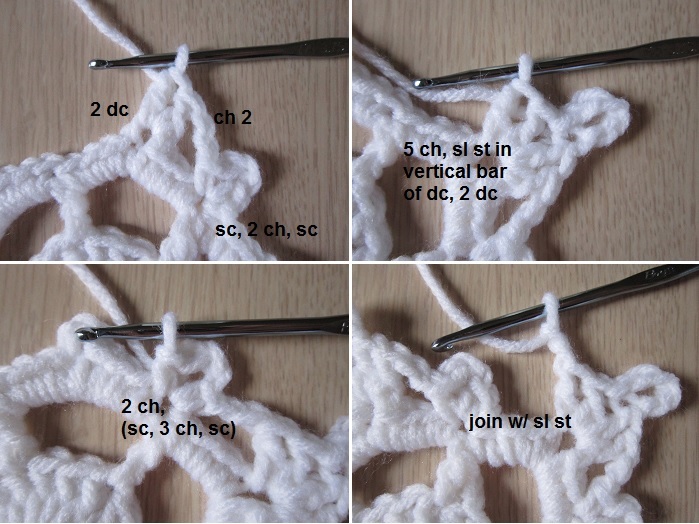 Chain 1, *(single crochet, chain 3, single crochet) in the space between sets of 4-single crochet. 2 chain, (2 double crochet, chain 5, slip stitch in the vertical bar of the last double crochet, 2 double crochet) in the next chain-3 space. Chain 2. Repeat from * to * 5 more times. Join with a slip stitch to the first single crochet made. I think snowflakes are great for winter decorations! These are perfect for adding a little festive touch to the table, but they would look great hanging from a tree, on a wall, or in a window. Since they use so little yarn, it would be 'cool' to make a bunch and have them hanging all around... They will make your guests 'freeze' in awe... Okay, I'll stop with the puns. At least I don't have to worry about these snowflakes melting in the Florida heat! Comment moderation is now enabled because of those nasty spammers - Sorry! Your comment will go through after you click "publish", but it won't be visible until approved. Sharon Silverman's Crochet Blog - Sharon Silverman Crochet: Your source for 'How To' crochet books and fashionable patterns with clear instructions. © Jenny Guldin 2012 - 2017. Simple theme. Powered by Blogger.